SOFT supporters are an incredibly generous bunch - from £20 at Christmas to remember their child, to £1000 in support of their friend's marathon efforts. 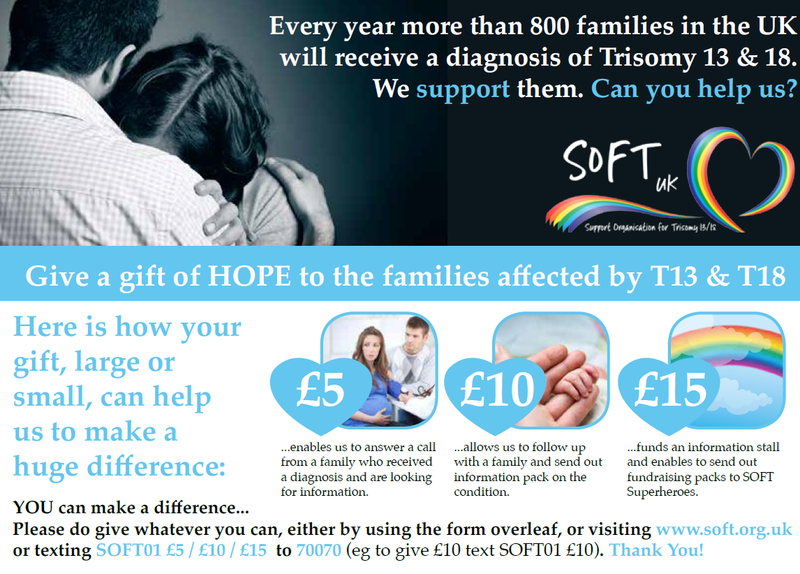 Many people who give a gift to SOFT have been personally affected by trisomy. We are grateful for every single gift we receive. The eaiest way to donate to SOFT UK is by using our online donation page at WONDERFUL. Wonderful process donations and for us FREE OF CHARGE. Wonderful do not even charge card processing fees. This means no administration or bank charges for us, so more of your money and our time can be spent on directly supporting families. . If you are a UK taxpayer you can even consent to Gift Aid your donation to us, meaning an extra 25% for us, at no cost to yourself. If you are unable to pay with a credit or debit card please contact us on administrator@soft.org.uk for alternative options. If you would like to make a more regular contribution to SOFT UK, its really easy! Simply go to our charity page on VirginMoneyGiving, where you can set up a regular payment by debit or credit card. You can amend or cancel the payments at any time through your online account. VirginMoneyGiving charges a 2% trnsaction fee plus a 1.5% card transaction fee. They do however claim Gift Aid on our behalf. So for a UK Taxpayer donating £10, SOFT UK would receive £12.15. Standing Orders are an automatic payment agreement, set up by you and processed by your bank. It takes around five minutes to set up and can be changed or cancelled with your Bank at any time, leaving you totally in control. 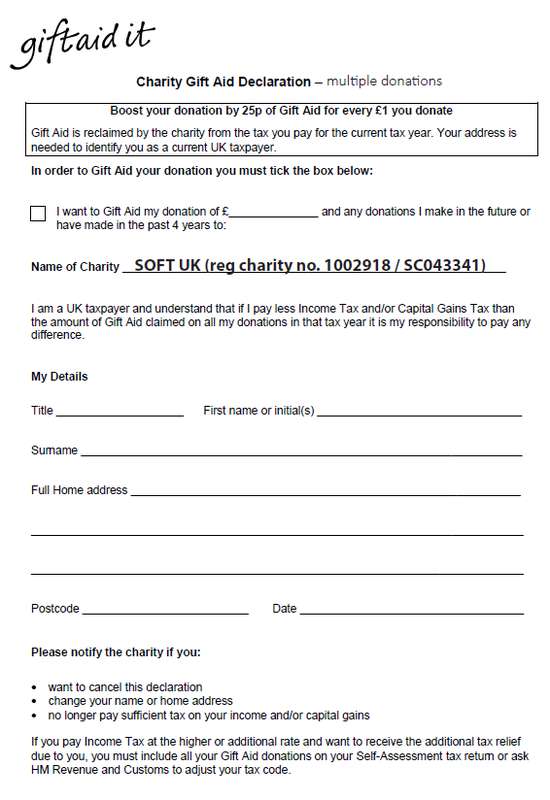 If you are a UK Taxpayer setting up a recurring payment and would like to Gift Aid your donation, please download the attached GIFT AID form and send it back to us at: SOFT UK, 48 Froggats Ride, Walmley, Sutton Coldfield, West Midlands, B76 2TQ. Alternatively you can download and complete the attached Standing Order form and return it to us, letting us do the hard work for you, including claiming GIFT AID. Payroll (or workplace) giving is fantastic way to give to SOFT. Any gift you give direct from your salary will come to SOFT tax-free - meaning we get up to 145% of your original donation. Regular giving is so important to SOFT - it enables us to plan our services more effectively and ensures we continue to meet the needs of families. Thank you to our many generous supporters who already give in this way. There are a number of organisations that offer Payroll Giving services to employers. You can use their websites to find out if your employer offers a scheme. If they do, you can usually sign up online. And if your employer is not already involved, they'll contact your company to encourage them to sign up. SOFT will usually begin to receive your regular gift 4-6 weeks after you have signed up. When you've taken care of your family and friends, will you consider helping the families of seriously ill children across the UK? Many people in the UK give generously to charities throughout their lifetime. However, a legacy is often the largest gift an individual ever donates to a charity. At the moment, only 6 out of every 100 people leave a gift to charity in their will but it's often the big-name national charities that benefit most from legacy gifts. SOFT UK is the only UK-wide registered charity dedicated to offering information and support to any family affected by Edwards' syndrome, Patau's syndrome or a related disorder. As we are a small charity, we're hugely grateful for those SOFT supporters who choose to think of us in their will. By leaving a legacy in your will to SOFT UK, you can help us to give some hope to future generations of families affected by Trisomy 18 and Trisomy 13. Your local solicitor or will writer will be able to advise you on the best way to make a new will or amend an existing one. It's a straightforward process but a will is a legal document and mistakes can be expensive to sort out for the loved ones you leave behind. * Remember a Charity has more information on how you can leave a lasting gift. They also have a network of solicitors and will writers who will be able to assist - you can search online for your nearest one. * Free Wills Month takes place every March and October. You must be 55 years old or older to take up one of the free appointments - and places fill up fast! If you've missed out you can register your interest online for the next event. * Money Saving Expert has an excellent summary of ways to make a will that are free or cheaper than standard.